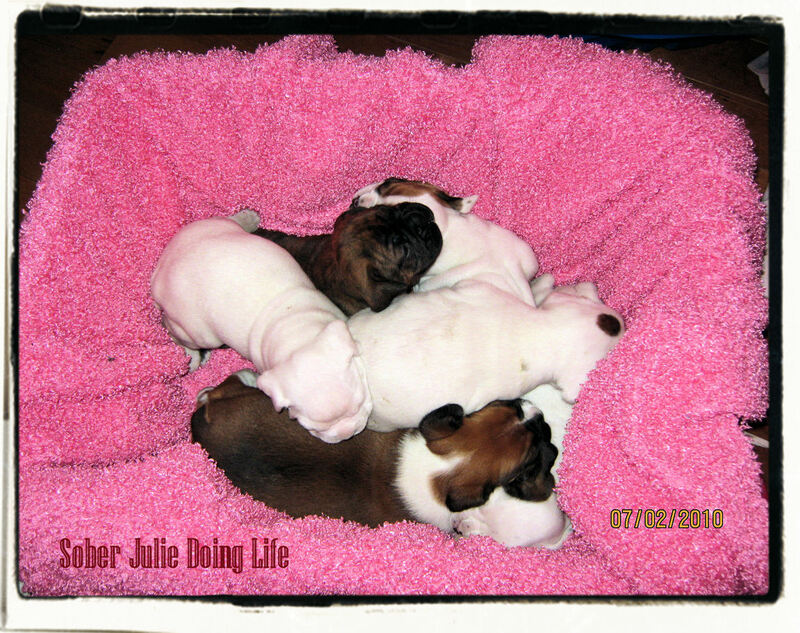 You Are Here Home » My Life » Family » Boxer Puppies – oh didn’t I tell you? 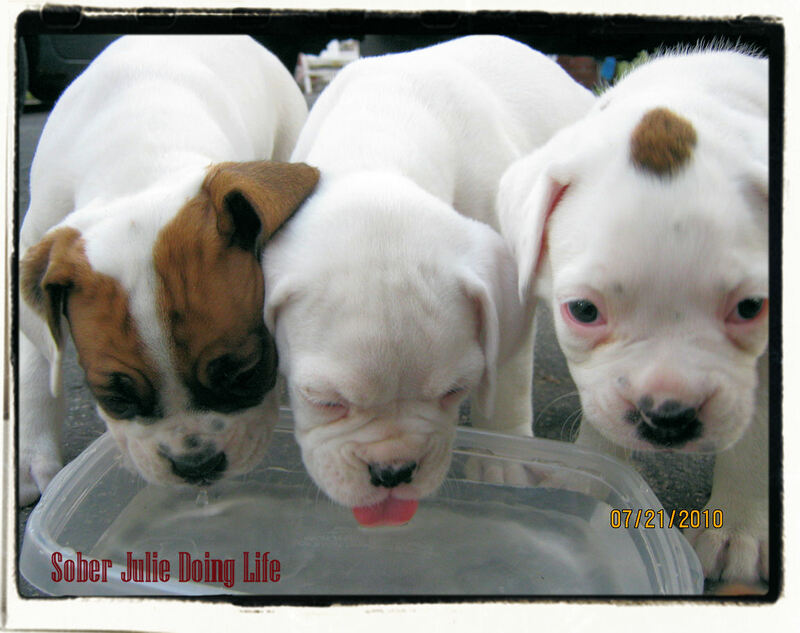 Boxer Puppies – oh didn’t I tell you? This past weekend we had an unexpected visitor. 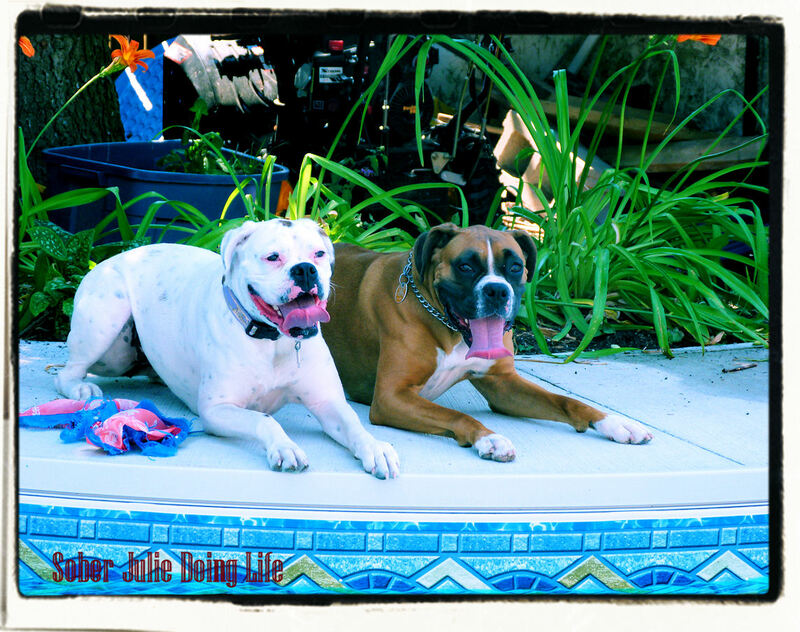 If you have read my blog at all, you should know that we have a Boxer who is a truly valued member of our family. Her name is Miss Cocoa Bean and she’s fantastic. 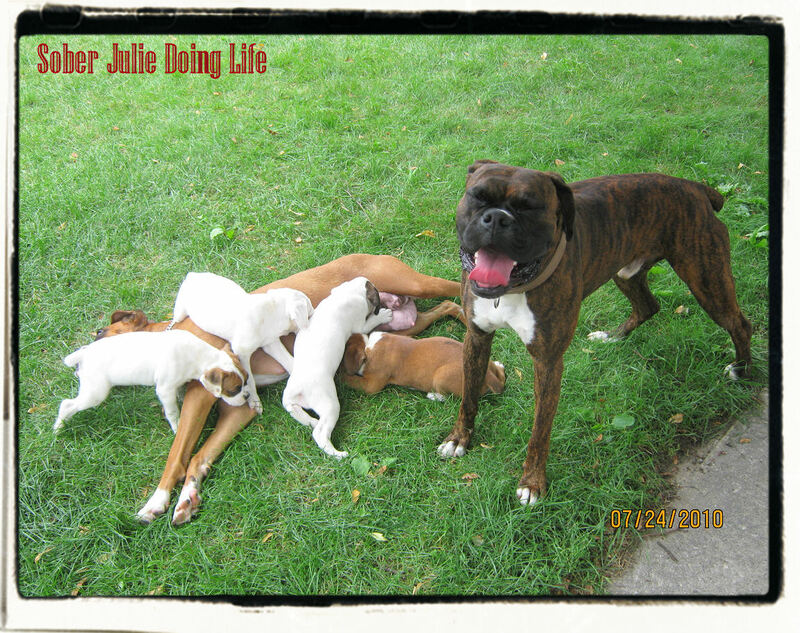 Last spring we mated her with a brindle boxer, Boston and she delivered 6 puppies in April 2010. The birthing process was humbling, she was a natural and I am in awe still as I look at the photos. 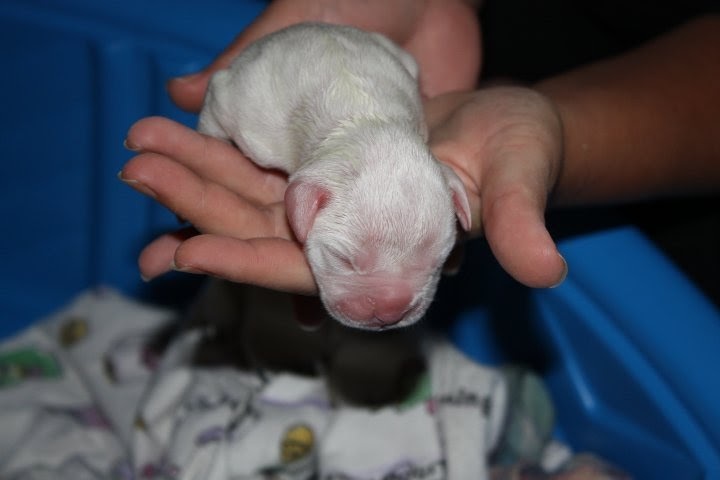 Me holding up the first born, all white boxer. Cocoa cleaning off the babies as they came out. Over the last year we have had photos sent from all the puppy’s families except for one. We just assumed that all was well and little Luna was doing fine. We are also fortunate that two of the puppies live in the same town and we get to do “playdates” every now and again. These puppies had out household in an uproar while they lived with us. Yes it was a lot of work for everyone, especially because I couldn’t bend to pick them up. Was it worth it? YES!!! They started out so small, little squeaky sounds filled the room as all four of our family sat staring at them. They were so beautiful….and easy. They could be carried around in a basket and contained in a children’s pool. 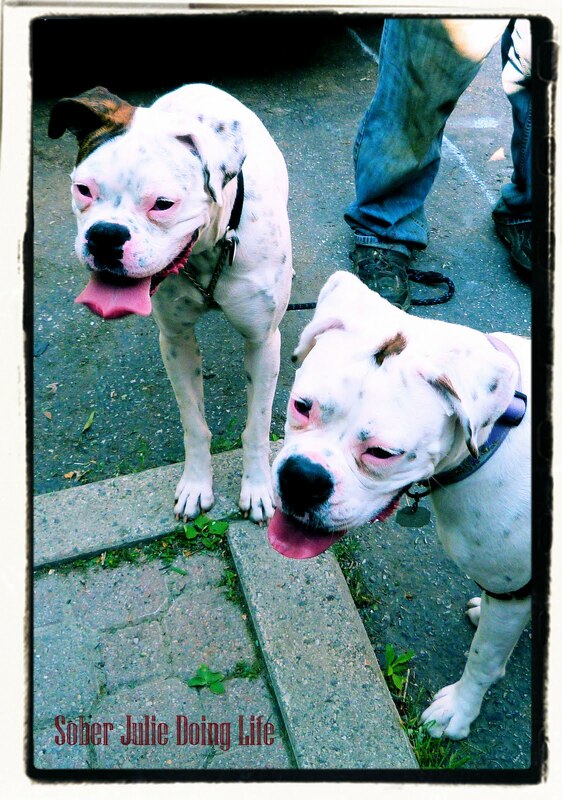 We began trying to take them for walks….what a challenge that was. There was no way of getting all 6 puppies to follow Cocoa, they were constantly distracted or stopping for a nap on the way. And so we got creative. Tadaaaaa! Puppies in a wagon, a fine idea until one curious, brave pup decided to jump out. She was fine but from there on we couldn’t contain the puppies in the wagon. Our neighbors thought we were nuts and got quite a kick outta this. Oh and if you want to be the hit of the neighborhood, just have a litter of pups and bathe them out on the front lawn. Of course Boston would come by and visit, that was always a hilarious sight. Cocoa didn’t like sharing his attention and wouldn’t leave him alone until she was tired from playing. As soon as she would lie down the pups would attack her for drinks. Until the day we introduced water…now that was funny. They consistently tipped over the bowls, stepped in it and put their noses under, sniffing and sneezing away. This is Molly, Lucy and Luna having a drink once they had mastered the art. The day came after 8 weeks, when the pups began leaving for their forever homes. This is Sydney with Luna the day she left. We had printed off photos of her since her birth, wrapped her in her blanket and we thought we would be relieved to have one less pup to chase after. It was quite sad for us, especially for Sydney but we knew they were all placed in fantastic homes and that was a relief. As I said earlier, 2 of the pups live in our town. 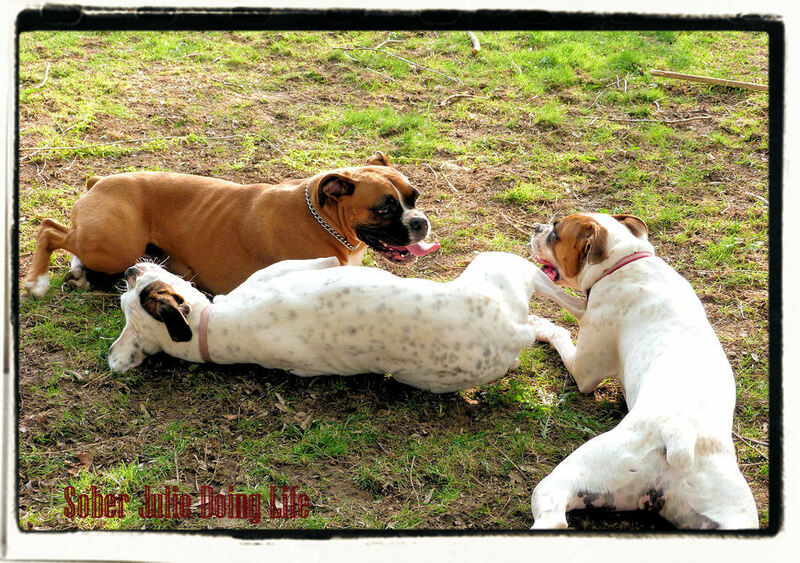 Here is Cocoa with her daughters, London and Molly earlier this spring. These dogs ran for over an hour straight before they finally fell to the ground heaving. This weekend when there was an unexpected knock on the door, we thought someone was looking to have a dip in the pool. Hubby couldn’t believe it when he saw Luna walking up the driveway. Her owners were travelling past our town and thought it would be nice to pop in for a visit. I swear, I must have looked like a total fool, I was so excited! Cocoa and Luna played and ran for an hour and a half and this is the only photo I could snap of them together. It was wonderful to see this little pup doing so well. She had some issues while with us, a skin condition which I treated by bathing her daily in special shampoo. She was my little favorite. Today she has no issues with her skin and is well loved, as her owners admit she’s quite spoiled. We were fortunate that one of the pups who lives in town could stop by, London, Luna and Coco certainly enjoyed their visit. Funny how they look like twins. Later in the summer we are trying to get a full litter reunion going, but in the meantime I feel like a lucky grandmother who receives the BEST photos! That’s it, that was what made my weekend. A simple visit which brought back so many memories and made us feel that we did good…..Are we having another litter? Puppies..Kittens, does it get any better?Love the photos, and so glad you got to see your Luna. Precious! We did a ton of research before we bred Cocoa. 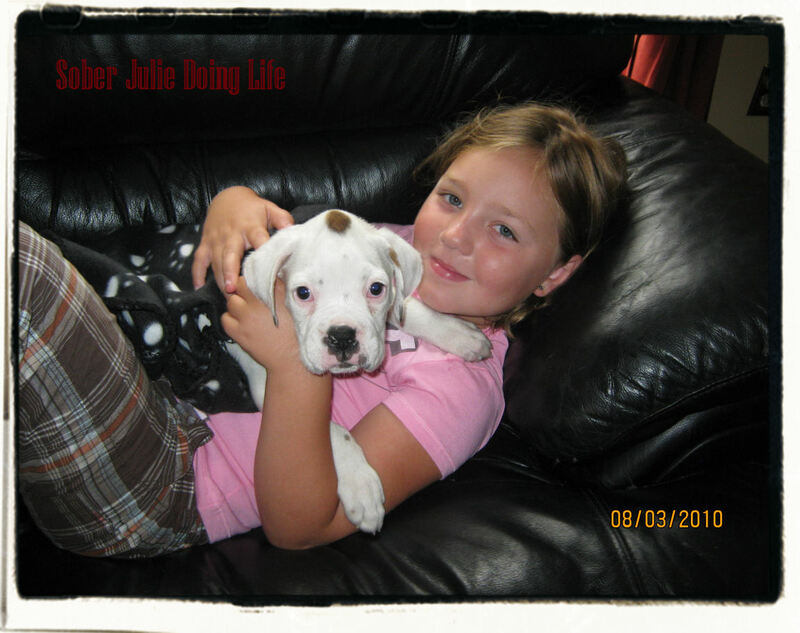 We were a foster family for Boxer Rescue Ontario for a long time and knew we were going to be picky about the homes.Cocoa's Mum was white so we knew there was a chance for her pups to be white. We have the ability to trace both Cocoa and Boston's bloodlines back quite a way.It used to be that white boxers were considered weak and not showable with the AKC or CKC. These days they do show whites, none of our 4 white girls have any health issues…other than a bit overweight ;)There are many breeders who do put down the whites still but honestly I think it's an 18% chance of having a white and something like 1% of those who have health issues.My stats could be wrong as it's been a year and a half since I've researched it.We did get a good price, more important for us was the quality of the home. 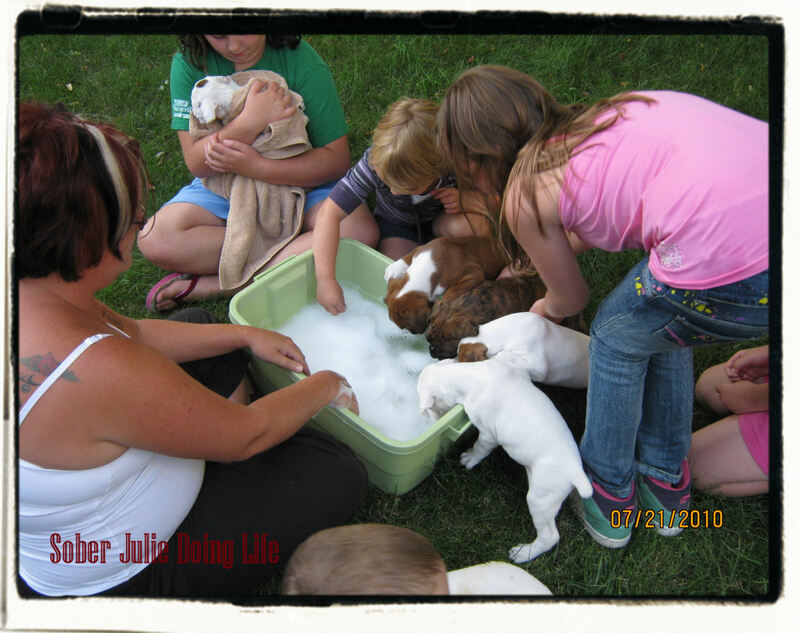 We had seen way too many dogs given away and losing their families while we fostered. Boxers are the best! Loved to see them go from puppy to doggy, great pics! What absolutely beautiful dogs! 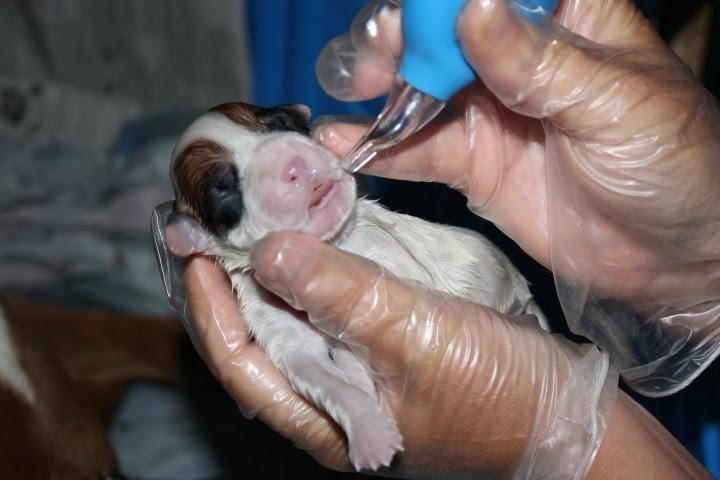 Gorgeous!Today was the first day that I ever saw puppies being whelped. I ran across some footage on Youtube and it was the most amazing thing. I can only imagine how powerful it is in person. 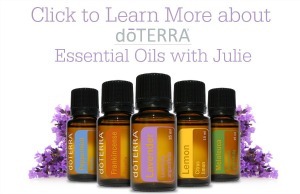 I started tearing up…at a Youtube video! I love Boxers, I had one growing up and if I didn't have three pug rescues or if I had a bigger space and yard, I would have a boxer again and will rescue one! This was an amazing and loving post, and yes puppies are so much loving energy it's almost overwhelming…thank you for this post and sharing with us the puppies journey and the shared day visit..
That's so awesome that you got a surprise visit! I had a litter of Malamutes a few years ago and NONE of the families have ever sent me a photo or contacted me. I've always wondered what happened to them!